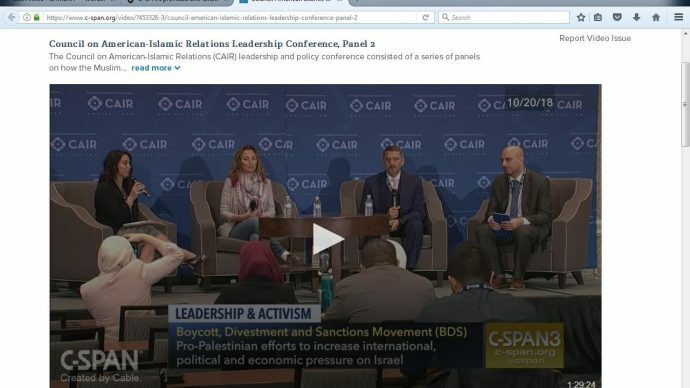 In October and November 2018, Cable-Satellite Public Affairs Network (C-SPAN), aired to its millions of viewers several broadcasts, including repeats, of panels of a 2018 “leadership and policy conference” of the Council on American-Islamic Relations (CAIR). One of the panels dealt with promoting the anti-Israel BDS (Boycott, Divestment, Sanctions) movement. Here, the network passed off as a legitimate news event, a propaganda session (90 minutes) provided by terrorist supporter, CAIR. Note that in United States v. Holy Land Foundation — which was ultimately decided in November 2008 — the U.S. attorney’s office in Dallas, Texas, listed CAIR as an “unindicted co-conspirator” with the Holy Land Foundation, a now-defunct fundraiser for the terrorist group Hamas. This in turn prompted the FBI to sever ties with CAIR which the federal agency had maintained in its connection to civil rights groups. Recently, the executive director of CAIR Los Angeles called for the termination of Israel. View entire discussion or any part of it. Screen caption: Boycott, Divestment, Sanctions movement (BDS) pro-Palestinian efforts to increase international, political and economic pressure on Israel. Panelists (above): Lena Masri (host): Litigation Director for CAIR; Ariel Gold: Co-Director CodePink (Women for Peace); Hatem Bazian: lecturer, University of California, Berkeley; Gadeir Abbas: attorney for CAIR. The broadcast begins with this voice-over statement from C-SPAN: “The Council on American-Islamic Relations (CAIR) recently held a leadership and policy conference on how the Muslim community can engage with the public and policymakers.” What’s missing here? In the interest of responsible journalism, C-SPAN should have at least informed viewers about CAIR’s problematic background. The BDS discussion demonized Israel and proposed strategies for BDS activities to isolate Israel. • At the outset, Hatem Bazian set the tone for the “discussion” in echoing the propagandistic Palestinian victimization narrative. 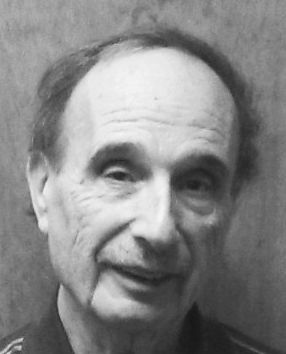 Bazian falsely equated the BDS movement to the South African anti-apartheid movement. But Israel is in no way like South Africa, where a minority of whites ruled over a majority of blacks who were denied the most fundamental human rights. In Israel, Arabs, Druze and Christians have equal rights and serve in high positions in government, business, the arts and academia. Bazian accused Israel of large scale theft: “Israeli universities and Israeli archives have stolen massive amounts of intellectual property that belongs to Palestinians – books, research materials. Just in the last uprising in Palestine, they actually completely emptied the research site of one of the Palestinian historians and all of his material is actually contained in the university’s Israeli archives. How, in an ethical basis of a university, can you deny the whole population, of their books, their history and their own narrative.” Can any part of this outsize claim be corroborated? Perhaps it’s a matter of making a mountain out of a molehill. Bazian provides no sources. Is there even a single reliable source for this accusation? • Ariel Gold (the lone non-Arab panelist), Co-Director of CodePink [American-based radical group] explained her group’s role in solidarity with Palestinians: “We at CodePink are always looking for what we can do to help in a situation. In terms of the occupation and ethnic cleansing [in 1948] of Palestine, Palestinians on the ground [during her trips to Israel and the West Bank] outlined a really clear framework of what could be done aside from going into the streets and spreading awareness …” Gold, a political agitator, bitterly complained that Israeli authorities, objecting to her activities which include harassing IDF soldiers and Border Police officers in the West Bank in 2017, recently cut her trip short, abruptly sending her home. Presumably Gold is oblivious to the reality that a political agitator, in solidarity with Israel, in the Palestinian territories or neighboring Arab countries would be treated much more harshly, likely violently. Gold’s propaganda about occupation and ethnic cleansing not withstanding, the fact is that Israel remains the legal, obligatory military occupational authority in the West Bank as a result of successful self-defense in the 1967 and 1973 wars, pending conclusion of a negotiated agreement on the territories’ final status. Israel left the Gaza Strip unilaterally in 2005. The West Bank Palestinians are self-governing with Israeli personnel only entering Palestinian communities to pursue terrorists. The comprehensive CAMERA report about circumstances in 1948 debunks the myth of ethnic cleansing of Palestinian Arabs. It shows that in the wake of Israel’s War of Independence in 1948, the overwhelming majority of Palestinian refugees were not expelled by the Israelis. But a much larger number of refugees, Jewish refugees who had resided in Arab countries for many generations, were forced to flee their native lands. • Panelists repeatedly charged that “anti-BDS legislation limits free speech” (or equivalent phrasing) thus violating constitutional rights. This claim is bogus. The legislation in various states does not restrict constitutionally-protected free speech or limit criticism of Israel or its policies. What it does is narrowly target commercial activity. The legislation does not create potential criminal or civil liability for BDS actions. Individuals who actively avoid purchasing goods and services because of their own political viewpoint would not be punished. The anti-BDS legislation is typified by the Texas version signed into law. The statute “prohibits all state agencies from contracting with, and certain public funds from investing in, companies that boycott Israel,” The governor stated that “We will not tolerate such actions against an important ally.” Likewise, in compliance with its anti-BDS law, New Jersey recently divested from Denmark’s largest bank for boycotting Israeli companies. BDS started in 2005 as a nonviolent protest about the predicament of the Palestinians. It evolved into demands to halt business with Israeli companies and the government of Israel, and ultimately to destroy the Jewish state. The movement established links to individuals and organizations that have been tied to Hamas, the Palestinian terrorist rulers of Gaza, dedicated to the destruction of Israel. What BDS actually advocates for is the end of Israel. Anti-Israel propaganda events, such as this one, are routinely broadcast as legitimate news events by C-SPAN without providing adequate, if any, context. The network never even bothers to issue a standard broadcast disclaimer such as: “Points of view expressed in this program are not necessarily those of this network.” C-SPAN’s chronic journalistically irresponsible conduct continues to be overlooked by its patrons – the cable/satellite TV provider industry – and the U.S. Congress which grants special access privileges to the network. Unfortunately, barring a huge public outcry, there’s no reason to expect any change.